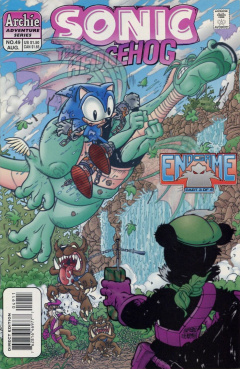 Sonic the Hedgehog 49 is the forty-ninth issue of the Sonic the Hedgehog comic. It is the third part of 4 issues of the Endgame saga, leading up to the 50th issue. This comic features one story: "Escape to the Floating Island!". Endgame, Part 3 - Escape to the Floating Island! Escaping from Geoffrey St. John, Sonic jumps out of a cave opening down the side of a cliff. The only way for him to survive the fall is for him to use his figure eight peelout to start hovering to cushion his fall. He tries to get his legs moving, but they are cramped up, also realizing that he is mentally and physically exhausted from all the events that have occurred over the past few days. He keeps trying to start up his figure eight, but can't do it, getting closer and closer to slamming into a river below. He finally gets his mind together and develops an idea. He takes off his shoes, revealing some very dirty socks, then lets the dirt fall out of them and into his hand. He then throws the dirt toward the nearby ground, beside the river, creating a temporary arc of dirt. He quickly gathers momentum and uses the dirt while it remains in the air, running faster than it can reach the ground. He successfully runs to the ground, but the dirt catches up, covering him in it. While he lays down on the ground, exhausted, Geoffrey and his men see him on the ground. He orders his men and their Tasmanian Devils to follow him, as they leave the cave to catch up to him. Still being chased after, Sonic realizes he can't rest, slowly and tiredly walking to return to Knothole Village. In the village itself, Robotnik continues to talk with the Freedom Fighters, who are now guarded by his Combots. He reveals to them that Sonic did, indeed, betray them, but also tells them that their King has not. He presses the back of the King's head, causing his body to explode, except for his head, revealing a robotic doppelgänger. Robotnik kicks the robotic head aside, mocking the Freedom Fighters for being fooled by a duplicate of their King. The Freedom Fighters protest, but the doctor simply tells them to be quiet or they will be vaporised. However, he believes that it would be too easy, and that he wants to see them perish with all other non-mechanical life. He mentions that he will allow them to live for a short time, until his latest creation is fully operational, which will destroy all life on Mobius. Meanwhile, in Robotropolis, Snively remains in charge while Robotnik is in Knothole. Doctor Quack arrives in his office, who tells him that he has mostly done what Robotnik has ordered him to do. To finish his work, he hands Princess Sally's death certificate to Snively. With his end of the work done, he yells at Snively to finish his end of the bargain as well. Snively, however, is not impressed with his attitude. He presses a button, opening a nearby wall, revealing Doctor Quack's family behind bars. Quack runs over to his family, but Snively closes the wall, while the doctor sobs, stating that Robotnik would release them if he falsified the records. Snively walks over, helping the doctor, and telling him that they will be released, as they walk out of the room into a medical ward. They walk over to a medical bed in the hall, which Snively mentions contains another person who will die if he doesn't do them another favor. He pulls the sheet away from the bed, revealing the King, still half-crystallized. Snively then reminds the doctor to obey their instructions perfectly, if he wishes to see his family again, and the King surviving. The doctor reluctantly agrees, as he carts the King away. Sonic finally arrives near Knothole, but still has quite a way to go. Realizing he is too tired to go on, he needs a plan as he has no idea how long the chase will drag on. Those last two words give him an idea, so he breathes in a lot of air and gives off a whistle that can only be heard by one person...Dulcy the Dragon, who arrives in a short period of time. As she lands, Sonic pleads with Dulcy that he didn't kill Sally, and that she can help him prove his innocence. Since dragons can sense the purity of truth, Dulcy believes Sonic, so she asks him what she can do. Sonic climbs onboard, whispering to her where he wants to go. The two then fly off, just as Geoffrey and his men arrive. He throws his bow to the ground in anger, missing him by a split second, but realizes that he can still track him, since he's still wearing the leg shackle with a locater beacon. At that time, Drago celebrates his victory in Hershey's, proclaiming himself the Duke of Mobius. Hershey walks up behind him, having heard that Sally was killed. He slaps a glass of wine out of her hand, blaming her for her death. She sits on the ground, crying, thinking that what she did for Drago was to help the Freedom Fighters, and that Snively was the one climbing down the rope, and not Sally. Drago drops a bag containing a Sonic disguise, claiming Hershey to be a sucker, and ordering her to put the disguise's head back on. She does so, then looks in the mirror, but, instead of seeing herself, she sees Snively. She turns around to Drago, and he looks like Snively as well. She takes the mask off and throws it at Drago, demanding an explanation. Drago shows the eyes of the mask, revealing them to be Robotnik's creation; optic image refractors with the ability to make anybody the wearer looks at look like Snively. He roars with pride at his victory of being able to rule a part of Mobius with Robotnik in town, while Hershey breaks down in tears, realizing what exactly she has done. On the other side of Mobius, in a large crater in Downunda, Bunnie Rabbot and Antoine D'Coolette are led, shackled, to their prison. While their guarding Combots push them along, Bunnie complains about the treatment they are receiving. Antoine tells her to be careful what she says, as a Combot reminds her that if she uses any of her robotic appendages, it will activate an explosive device in Antoine's collar. They throw them into a room, shacking them to a wall, where they intend to leave them forever, slamming the door to the dark room shut. It doesn't take long until Antoine notices something moving in the distance. Light from a prison window reveals a beaten up wallabee and a koala, which Bunnie recognizes from Tails' reports on Downunda: two of the Downunda Freedom Fighters. Walt Wallabee introduces himself, as does Barby Koala, who asks if they saw a certain somebody upon entering. Before she can finish, a bright light appears as Walt and Barby try to hide. From aside, the mighty Crocbot appears, seemingly back from the dead, introducing himself as the warden of the Downunda Prison Camp and their worst nightmare. However, instead of his normal robotic form, his lower torso is fused with his old tank. He explains the circumstances revolving around this, reminding the group of Tails and Guru Emu sending him crashing into the crater, causing a massive explosion. Although heavily damaged, he survived, using the tank fragments to help reconstruct him. He then went through the wreckage of Robotnik's supply blimp, and, using Robotnik's designs, salvaged as many bots as possible and created his own army modelled after the Combot. Using them, he constructed the prison they are now in, to capture and punish Robotnik's enemies. He relishes in eventually being able to capture the Downunda Freedom Fighters, and torturing them thereafter, something he looks forward to perform on Bunnie and Antoine. He then intends on sending their remains to Tails, so he can get him to return to get revenge. He laughs as he leaves the room, leaving Antoine and Bunnie to contemplate their fate. Some time later, Dulcy and Sonic arrive at the Floating Island, while Sonic has a well-deserved nap on her back. She wakes Sonic up from his slumber as she sets down to land. Before she can even touch a foot on the island, Knuckles pops out of the bushes, telling her she doesn't have his permission to enter the island. He attacks her, knocking her out and sending Sonic flying to the ground. He stands up and confronts Knuckles, accusing him of attacking the most peaceful and gentle creature on the planet for no reason, but Knuckles is still not pleased. Before he can attack, Sonic punches Knuckles aside, but he is quick to recover, gliding back and punching Sonic. They both recover and dash at each other, to be interrupted by a burst of fire. The two look up to see Geoffrey St. John arriving via parachute, telling Knuckles that Sonic is his to take down. According to Sally's death certificate, her middle name is revealed to be Elisha. This would later be retconned and changed to Alicia. Doctor Quack's first name, Quentin, is first mentioned, while his wife (Elizabeth Quack) and kids (unnamed) are introduced. The first name of Quentin would later, often, be interchanged with the name Horatio, so both were eventually combined as his first name. A Sonic pin-up is included in this issue, featuring Sonic over a pile of destroyed SWATbots and Combots. This pin-up was drawn by Nelson Ribeiro (his first pencilling work for the comic) and Harvey Mercadoocasio. In Sonic-Grams, Bunnie answers the reader's questions in lieu of Sonic.